With the growth of cloud, virtualization, IT-as-a-Service, and Big Data, organizations today are contending with major technology shifts. The impact spreads beyond implementing the technology itself; organizations must reinvent themselves, and new skills and roles are required. Back in 2004, EMC realized that education was key to helping our customers get the most from their technology investments. Since that time, EMC has put tremendous effort into developing the EMC Proven Professional education and certification program to help fill the industry’s skills gap and facilitate successful storage, cloud, and Big Data implementations. 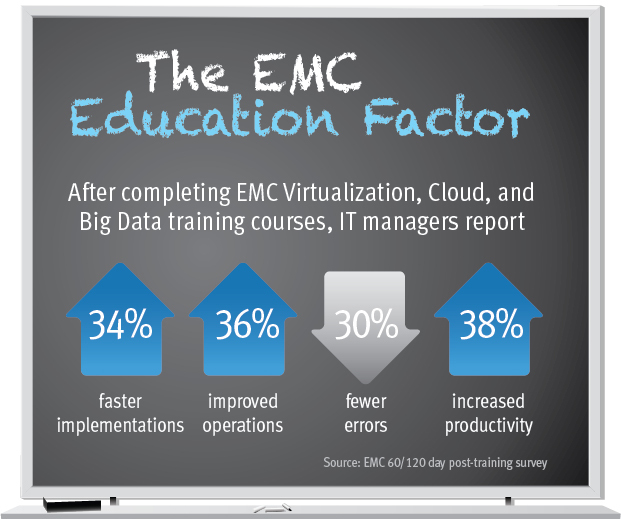 In fact, our research shows that after completing EMC virtualization, cloud, and Big Data courses, IT managers report significantly improved results. Since EMC launched the Proven Professional program in 2005, it has grown rapidly, been broadly adopted, and received industry recognition. Today, I am excited and proud to share that we have hit the milestone of 100,000 Proven Professional certifications! We believe Proven Professional is now the largest certification program in the Information Storage and Management industry. Through the Proven program, there is now a vibrant community of highly skilled partners, customers, EMC employees, and IT professionals across the industry, helping their organizations achieve new levels of success. Proven Professional certification provides IT professionals with credibility and increased market value—up to a 10-14% salary premium for EMC’s Cloud Architect certification, according to Foote Partners in a recent CIO magazine article. Being Proven ensures that IT professionals keep current, connect, and collaborate through such programs as the EMC Knowledge Sharing awards. EMC’s education efforts also extend to building the next generation of IT professionals. The EMC Academic Alliance Program (EAA), also launched in 2005, has just achieved its own significant milestone. There are now more than 1,500 academic institutions participating in the Academic Alliance program, which provides universities worldwide with technology curricula to educate and prepare tomorrow’s IT and data science professionals and helps meet the industry’s growing demand for advanced technology skills. Through the EAA, EMC provides faculty with its industry-standards-based “open” curriculum, free training, and resources to teach information infrastructure technologies that prepare students for future technology careers. The excitement about EMC’s education initiatives is spreading across social media as well. Facebook pages for the EMC Academic Alliance and EMC Proven Professional are attracting more than 1.1 million fans. This is a real testament to the global interest in these programs and recognition of the importance of education to the industry. Education accelerates IT transformation and drives better, faster results for organizations. As we like to say, lead the transformation and get Proven!